I know a lot of you already know what Dumfing is but we have had lots of enquiries lately so I thought I would do a proper blog to attach to the link on the side bar. Dumfing is our word for embellishing. Back last October Twiglet and I bought ourselves a Huskystar ER10 Embellisher each and we both agree that this has been our best 'toy' ever purchased. 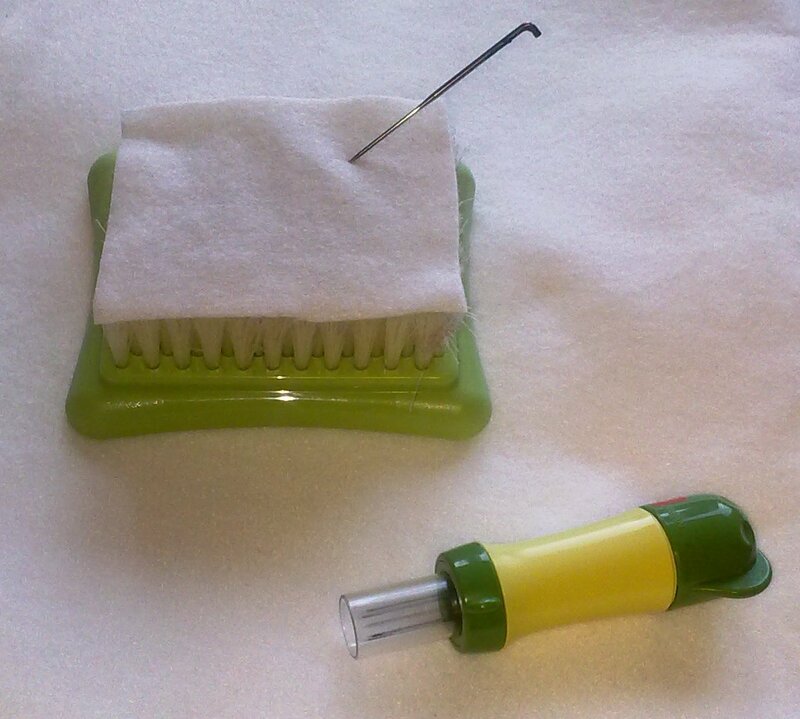 Up til then we had used single embellishing needles or hand held embellishers with several needles in as shown here with the Brush to work on [I always keep a piece of felt on the top while working on it]. Embellishing needles are barbed needles that push fibres from one material into the other so locking them together. The barbs only face one way so that the fibres are pushed down but the needle then pulls back out clean, leaving the fibres behind. Hand held ones work perfectly for small hand held items like the bears I make but it takes time and lots of patience [and, in my case, fingers that end up like pincushions!]. For larger items the embellisher takes over beautifully. We have made covers for books, brooches and larger pictures to name but a few of the items and you can find some of these over in our blog shop. 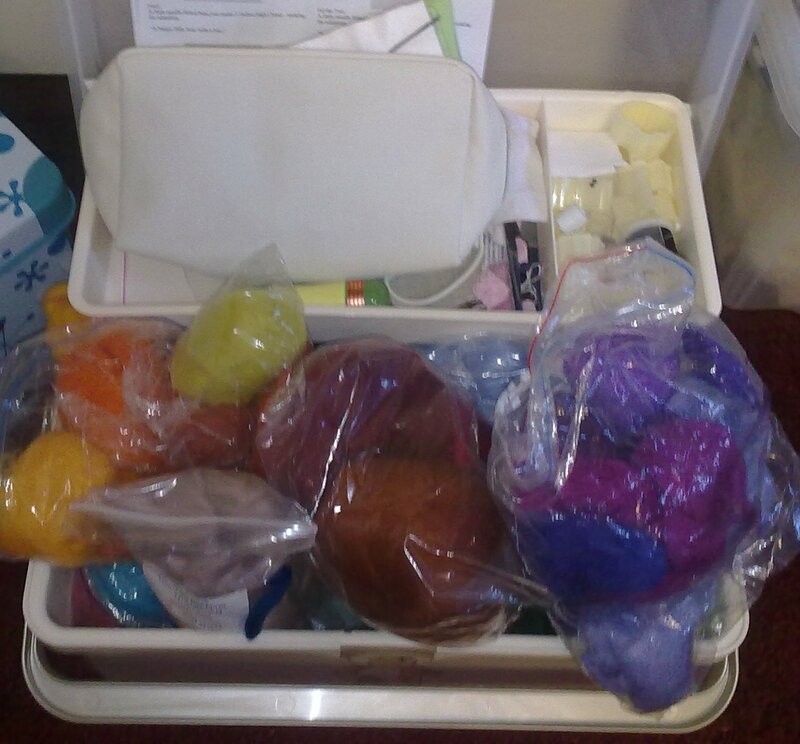 We are able to combine threads, wool rovings, fabrics and all sorts of embellishments and produce really yummy things. If you google dumfing you will find our blogs come up top of the list and my son has even tried to get it put in a dictionary :-) I would advise anyone to get themselves an embellisher but beware it will take over your life...in just the best of ways. Here are just some of the ways it has taken over mine and some of the gorgeous things Twiglet and I have made with it. Yummy dumfable fabrics. Natural fabrics such as wool, silk and linens work best but we have found lots of man made ones work well too so well worth trying anything. A hand dumfed bear. I have spent many a relaxing night dumfing whilst watching the telly. Dumfed Poppy picture. 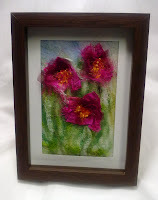 I have made, and now sold, very many pictures and really love the 3D effect you can get with fabrics to make beautiful flowers. A brooch made from dumfling loveliness. Twiglet has made some really gorgeous brooches of all colours and happily takes orders it colours have to be specific. There are so many other really fab cards, books etc over in the shop it's well worth making a coffee, pulling up a chair and having a browse. I tell you I have peered and prodded and poked (very tenderly of course!) my beautiful Poppy to try to figure how it has been made and I was always left as I started - with absolutely no idea at all! lol! I have no idea how your wondrous machine does it's business but all I can say is it just fabulous! Id get excited at the thought of having new storage boxes too! I Love that little pink teddy! but whatever you decide I love mine. Thank you so much for explaining. great explanantion: the thought of hand dumfing actually makes my toes curl! I'm sorry about yesterday - I visited you almost as soon as I finished my own post, am guessing that I clicked away before doing the word verification...I do it more often these days - such a mix of verification and no verification that I forget where I am. I wanted to say that of all the people I know, I bet you know exactly what's up on that shelf and I wonder if there'll be any serendipity going on when your RUBs arrive. See through storgae is such a blessing! Brilliant explanation Wips - 10/10 for clarity. Now I suppose you want to video me at it!!! I made some rugs and things using that technique back when I was a student. I wonder if I still have my needle somewhere in storage? What a fab explanation Annie. I seen it done by hand before but I didn’t realise that you could get a machine to do the task for you…….most definitely saves the old fingers I should think. The two of you create such wonderful works of art…..simply beautiful! Everytime I see yours and Twiglets embellished pieces I want to have a go too. oh goodness...there is a whole new world out there! I kept seeing the word dumfed all over on the WOYWW posts and now I got it! Missed this first time around. Great explanation. Twiglet has posted it in PCoo so you may get some more visitors to it! I read the dumfer explanation in a previous post, but I'm really glad you reposted. I remembered the dumfing, but couldn't remember what the machine was. 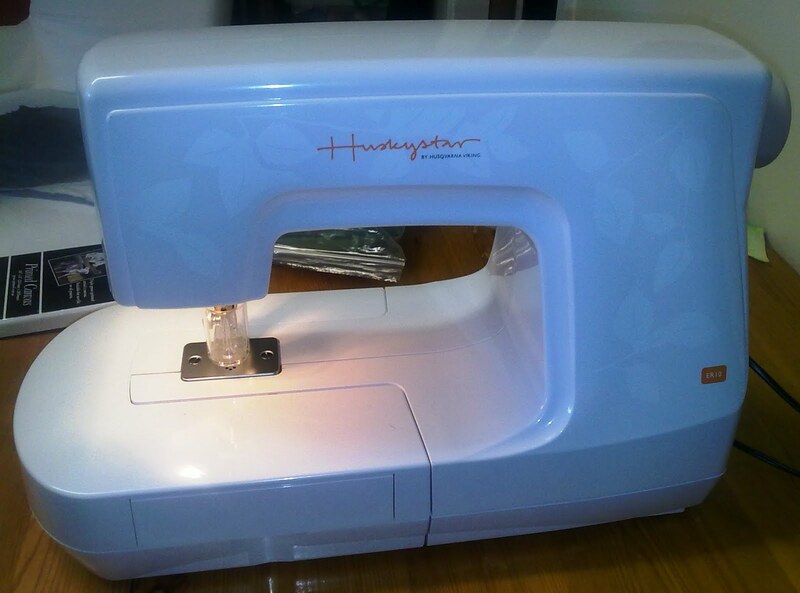 Now I know it's a Huskystar ER10 Embellisher and I can learn more about it. I really want one and now know what I'm looking for. It's a good thing you made this post for another reason. Although I'm not playing along on WOYWW this week (I only got around to about 80 blogs last week and feel guilty), I am featuring you and your blog as my blog of the day for today (May 12). Although it's ironic that you chose to post about your dumfable dumfer, I had already decided on your blog. So have a dumfable Wednesday and a great WOYWW, too. I will miss playing, so this is my way of staying in touch with WOYWW. Now I know what dumfing is lol - well sort of baring in mind I'm not a needle person of any sort. i can only just work me sewing machineh hehehe. Intrigued by the word 'dumfing' on your sidebar I thought I'd take a look. And what a treasure - such a fab word. And as I'm getting an embellisher for Christmas, I'll be a dumfer soon too - woo hoo!! Thanks for linking the tut into artsee bloggers. I think dumfing is the same as felting??? This is something I've been thinking of trying for some time now - I saw some hand-dumphing going on at a craft show and thought "What fun!" As for the name, I laughed out loud when I read what it was!! 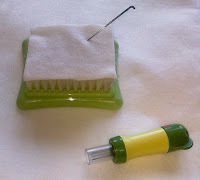 It reminded me of the little hand drill people have in their toolboxes - in our family this tool is known as a Gregory. That's because when you turn the handle, it goes "gregorygregorygregory"!!!!! Thanks for the explanation on your dumfing certainly a lesson for me. Hello there, I have just been given your name to help me and now I know why! I have been given a felting machine as a present for a special birthday and don't know where to start, please could you recommend a book to help me on the road to discovering it's uses?